Norma has joined us again here at Splendid Recipes and More (SRandM) to share more with us about the Tastes of Mexico (link here for previous post with Norma: Mexican vs. Tex-Mex: What is the Difference? ). SRandM: So Norma, welcome again to Splendid Recipes and More. Norma: Thank you. I am glad to be here again. SRandM: I am really excited to get started, so tell us what you have for us today from Mexico. 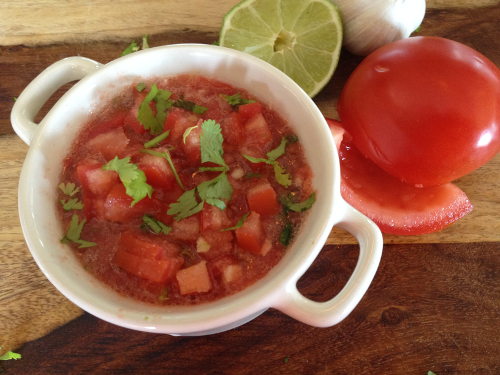 Norma: I will be sharing a recipe on how to make Homemade Guacamole and Mexican Salsa. First I would like to tell you a little about the avocado, if I can? SRandM: Sure Norma, I would like to know and I am sure our readers would too. Norma: The avocado tree is native to Mexico. The avocado is a tree native to Mexico and Central America. The avocados that are sold in the markets are from California, but also from Mexico. The name of the fruit is Persea Americana, and yes the avocado is a fruit, not a vegetable. Also the avocado oil that is now being sold at the markets in the U.S. is from Mexico as well. OK, so let’s get with the recipe. Here is what you will need. So with a sharp knife, slice the avocado from top to bottom, cutting all the way around the fruit. Place the avocado in the palm of your non-dominant hand and gently starting at the top slice down to the bottom of the fruit and up the other side until it easily separates into two pieces. SRandM: If you don’t mind Norma here is an image I got from theamazingavocado.com. Norma: No, please share it. Yes, as the image is illustrating remove the seed with a fork or spoon. Or as I do just whack the seed with the sharp knife your using so the blade sticks into it. Then gently turn the knife until the seed pops out. Now to dice the avocado, score the flesh while still in its skin but cutting equally sized slices from top to bottom. Then, rotate 90 degrees and do the same thing going side to side. 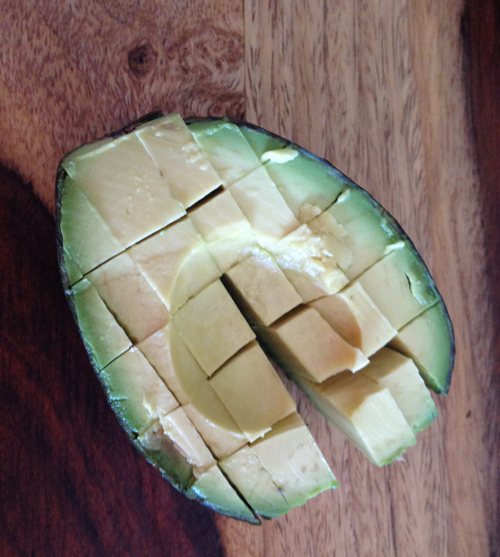 This combination of horizontal and vertical cuts will give you equal sized chunks of diced avocado. To remove the diced fruit from the skin, take yourself a spoon and gently scrape all on the bottom of the flesh where it meets the skin until all your diced chunks are removed. While you are removing the chunks place them in a medium bowl. 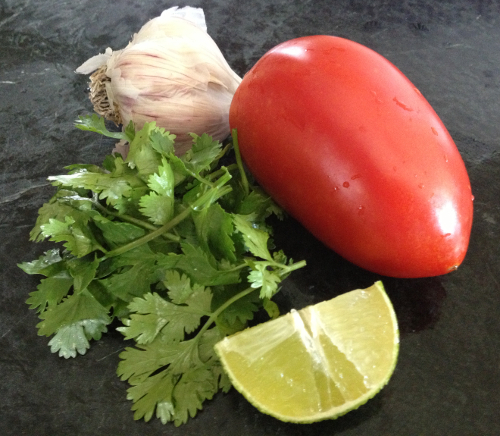 Next we will add the diced tomato, minced garlic, lime juice and fresh cilantro to the bowl and combine with a fork. If you want season with salt, pepper and additional lime juice to your liking. Now you have Homemade Guacamole to serve with your favorite Mexican entrée or on its own with corn tortilla chips. SRandM: Wow this looks great Norma, now what about my favorite, Mexican Salsa. Yummy. Norma: The traditional Mexican Salsa is made with an authentic Mexican Molcajete Mortar and Pestle. 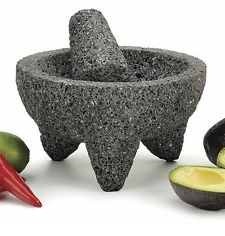 SRandM: The molcajete is made from stone? Norma: Yes, mostly from Granite. But I am sure most of your readers do not own one, so we will be using a food processor or blender to make our Mexican Salsa. SRandM: If someone wanted to purchase one, where could they get a stone mortar? Norma: Will at your local Latina Market or on-line at Ebay or Amazon. OK here is what you will need for the salsa. Oh, first I would like to say the best time to make this recipe is at the height of summer when there are plenty of fresh tomatoes available. If you have your own vegetable garden, that’s even better. SRandM: Wow I can already taste it. Norma: OK hold on we’re not done yet. Now cut the tomatoes into quarters and place them into a blender or food processor. Next add the garlic cloves and half the lime juice. Pulse until the ingredients are thoroughly combined. Dice the remaining tomato into evenly sized small pieces. Stir into the tomato mixture so it creates a chunkier texture. If that is something you don’t like, don’t add the extra tomato. Next stir in 1 to 2 tablespoons of fresh cilantro and you can adjust this according to your personal preference or taste. Add the remaining lime juice and season with salt and pepper, to your taste. SRandM: What if you want a spicy or hot salsa? Norma: You can add one to two Serrano chilies without the seeds and stem, along with the tomatoes before pulsing. Now serve with your favorite Mexican entrée or by itself with tortilla chips. SRandM: Wow this was great Norma. What will you share with us next time? Norma: How about Chicken Quesadillas to go with the Guacamole and Mexican Salsa? SRandM: That sounds good, looking forward to it Norma. So to our readers we hope you enjoy the recipes Norma shared with us, Homemade Guacamole and Mexican Salsa. Return tomorrow for her Chicken Quesadillas. This entry was posted in Guest Speaker and tagged Avocado, Ebay, Garlic, Guacamole, Lime (fruit), Mexican cuisine, Mexico, Norma. Bookmark the permalink. ← Mexican vs. Tex-Mex: What is the Difference? Another great post! And Avocadoes are my fave! Thanks Chef Kim!! Yes, avocados are great. I have even been using avocado oil to sauté with and use in my salads. 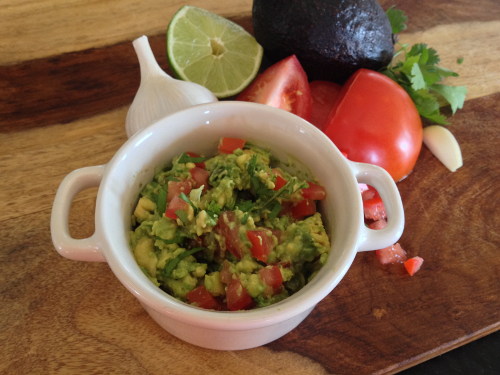 I love a guacamole so much,I can eat it every day.Great recipe. Ya isn’t guacamole great!! Thanks for your visit and comments Mirror of Your Health! !